In 1995 Capt. Steve Briggs took the helm aboard the Schooner Ernestina and Gregg Swanzey stepped ashore as executive director. Steve came from extensive commercial background based in Virginia. Capt. Briggs has held his USCG Master license for ten years and has skippered HARVEY GAMAGE, the 1907 three-masted Schooner ELINOR, has served as mate aboard SSV TOLE MOUR in the Pacific, and SPIRIT OF MASSACHUSETTS, NEW WAY and the 130 Brigantine YOUNG AMERICA. Steve also has extensive experience as a tugboat captain engaged in marine towing, salvage and construction.Many people in the business of operating ships know his father, Lane, who is often spotted aboard his Tugantine the Norfolk Rebel. 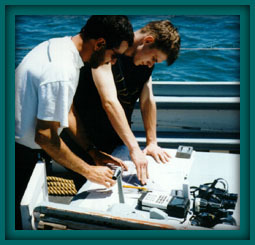 Notable steps taken in 1995 included the first full sailing season under a new organization, the publication of the first annual Business and Spending Plan, completion of financial statements through FY 1994, completion of the first State Audit since FY 1990 and transition to the State MMARS (accounting) system. 2,500 schoolchildren and 650 teachers were served with structured programs and more than 20,000 visitors were received at the ship. 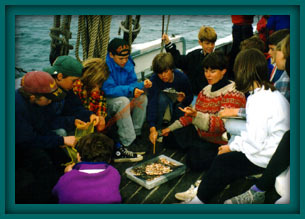 The 1995 sailing and teaching season began with a flourish as the Boston Public Schools hosted a very important first program of dockside and underway programs underwritten by a generous grant from the Boston Marine Society. Over 650 Boston Public school students (grades 3 - 12) and their teachers came aboard during May. The programs ranged from two hour dockside sessions to half-day sails out among the Harbor Islands. Co-sponsorship by the Department of Education and Department of Environmental Management provided for a series of meetings on the decks of the Ernestina in June bringing educators, teachers, institutions and agencies together through the Mass Bays Program and Massachusetts Bays Education Alliance. The ship sailed from Quincy at Bay Pointe Marina, Boston at the Charlestown Navy Yard and Gloucester at the Gloucester State Fish Pier for three hour sails designed to highlight local activities in education and action and to set the stage for connection, networking and coordination to enhance future activities. One of the most important efforts of the year involved the development of structure for the educational programs. The structure and content for the program came from the extensive background of the crew. Brief bios follow that give some hints of the variety of vessels also engaged in education at sea. Amanda Madeira, first mate and holds a captain’s license. Amanda possesses remarkable skills as an educator gained through years of training and professional experience with programs aboard HARVEY GAMAGE, REGINA MARIS, ANNE KRISTINE, WHEN & IF and BOWDOIN. Most recently, she has worked with Schooner ADVENTURESS on Puget Sound, which offers a program focused mainly on environmental education for public school children. As a student at Hampshire College, Amanda became especially interested in salt marsh ecology and did extensive field work here in southeastern New England. Amanda is also Ernestina’s artist-in-residence, having received a Master of Arts degree from Montserrat College of Art, as a sculptor. Doug Randall also serves as mate and holds a captains license. Doug is in the mainstream of maritime preservation and education. As a scholar he has done archival work at the USS CONSTITUTION Museum with the Joshua Humphries Papers; as a sailor he has shipped aboard HARVEY GAMAGE, SHENANDOAH, CALIFORNIAN and with the R. TUCKER THOMPSON, an educational sailing program in New Zealand. He is managing the effort to preserve the historic tugboat LUNA (LUNA Preservation Society, Boston) and recently worked on the Steering and Background Committees for the Harbor Visions Charette, held in Boston last fall. Doug represented Schooner Ernestina at the Maritime Heritage Conference, held at the Charlestown Navy Yard in September, at the Boston meeting of the National Trust for Historic Preservation and at the annual convention of the American Sail Training Association, held this year in Bridgeport, CT. He has a background in graphic design and a B.A. from California State University, Long Beach. Laurie Belisle is Onboard Educational Coordinator. Laurie has been a public school teacher, an instructor aboard a variety of sail training vessels and a commercial photographer and designer. She holds a USCG Master license and has sailed in the Caribbean, across the Atlantic, on the Mediterranean and Red Seas. Her pursuits have taken her to the mid-Pacific Ocean aboard TOLE MOUR with the OceanQuest youth-at-risk programs, to New Foundland and Nova Scotia as educator aboard ANNE KRISTINE and into Puget Sound with the environmentally-focused program of Schooner ADVENTURESS. Tora Johnson comes to Ernestina with a rich background of research and teaching in the fields of marine biology and environmental education. 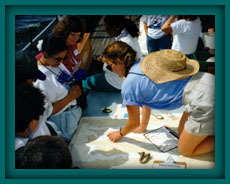 She has developed and implemented curricula for programs on Long Island Sound, New York Harbor, Mystic River, Hudson River and Fishers Island Sound under the auspices of the Voyager Cruises Coastal Ecology Program, the CLEARWATER programs and Williams College-Mystic Seaport Program in American Maritime Studies. These activities have brought her a broad range of students including elementary, special education, at-risk youth, secondary and university level. Tora is a graduate of the University of Oregon and did post-graduate research work at the Oregon Institute of Marine Biology. Jeanna Ozyck comes to Ernestina after experience on the schooner ADVENTURESS and Sloop CLEARWATER as an environmental educator. Jeanna is a natural teacher with special experience in group facilitation, conflict resolution and mediation. Traudi Coli is Ernestina s onboard anthropologist. She holds a graduate degree from Rhode Island Colleges African and Afro-American Studies Program where she studied the history and culture of the Cape Verde Islands with a special interest in the sailing packet trade. A long-time devotee to the Ernestina cause, Traudi can "reef, hand and steer" with sailors twice (or three times) her size. She worked 45 days last year as an ERNESTINA volunteer and has signed on this year as regular crew/educator. Traudi is fluent in six languages and holds a second graduate degree in the field of health care. Russell Ramos is a videographer by training; a Cape Verdean by birth and a teacher by nature ~ a great combination for ERNESTINA! He has taught in a variety of settings including DYS and other youth programs. This season he leapt aboard for a three day at-sea program with DYS and immediately "clapped on". His skills and insight as a councilor and teacher are invaluable. Joe Andrade is the crew member with perhaps the most time aboard Schooner ERNESTINA. Joe shipped on as an apprentice with Capt. 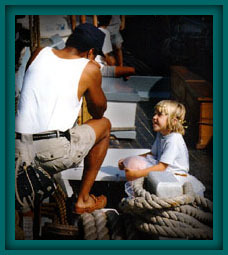 Dan Moreland for several summers and traveled thousands of miles aboard the vessel, learning the skills of deckhand. Since that time he has left New Bedford to serve in the U.S. Army and is now completing his degree in aeronautical engineering at Bridgewater State College. Steve Bibula is steward extraordinaire! Ernestinas crew and her guests are well fed this season thanks to this master-of-the-galley. Steve has been culinary commodore aboard Sloop CLEARWATER and has presented his delicious fare up and down the Hudson River valley. Shoreside, Steve tends an organic garlic farm in the Berkshire Mountains. Aaron Macedo is serving as deckhand while developing his skills as a sail training instructor and bosn. Aarons knowledge of the mechanical and engineering systems of the schooner is becoming legendary. He has sailed previously as volunteer crew and works through the year on maintenance projects along with Marty Casey and other volunteers. Tom Demanche, a graduate of Massachusetts Maritime Academy, is serving as chief engineer. Toms background includes extensive work with Diesel engines of all sizes, steam and boiler operations, tugboat and towing work and power plant systems. Alex Fenton ~ stepped on during August bringing with him considerable experience: he has served as Waterfront Director for Mass. 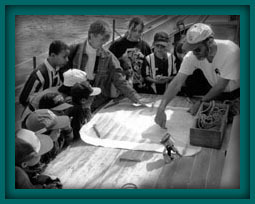 DYS programs at the Stephen L. French Youth Forestry Camp in Brewster, MA, and has shipped as first mate aboard Schooner HERITAGE for three seasons. Alex holds a U.S.C.G. 100 ton Masters license and as a professional ski patrolman (Stratton Mt., VT) is highly trained in rescue and first aid. Ken Cabral ~ who sailed and cooked for the Marthas Vineyard programs at the end of August and commanded the galley during the Labor Day weekend tending a full ship from New Bedford to Gloucester and back. Ken is retired from the North Providence, RI, Police Department and now divides his time between artistic (drawing and painting) and culinary activities (private catering, Prov. Police Dept.s Camp Phoenix program). Kens talent and skills are reflected in his educational credentials: Boston School of Fine Arts, Johnson & Wales and the law enforcement program at Bryant College. However, like Mitch, Ken was a "team member" from the outset and not only set out great meals, but supervised a gracious galley where people and provisions were treated with great care and regard. Fred Sterner ~ with a background in business and education, knowledge of marine operations and maintenance and holding a 50 ton U.S.C.G. Masters license, Fred was a great addition to the Ernestina staff during August and September.